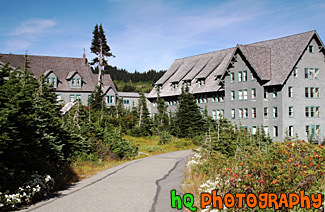 A scenic picture taken of the Paradise Inn which is located near the base of Mount Rainier in the national park. Paradise Inn welcomes guests from mid-May to early October each year. Set against the spectacular backdrop of Mt. Rainier and the Nisqually Glacier, the inn is surrounded by glorious flowering meadows and scenic winding trails. Paradise Inn was built in 1917 using Alaskan Cedar charred by a fire and taken from the nearby Silver Forest. Hand-hewn furniture, tables, piano, and grandfather clock still grace the lobby of this lodge. The National Park Inn was moved to its present location in 1920 and was rebuilt after a fire destroyed much of the original building in 1926.